As Sara Lee Corp. got hit by another lawsuit Tuesday related to a massive food-poisoning outbreak traced to its Bil Mar Foods unit, the company said it will move manufacturing of some hot dogs and deli meats out of its Zeeland, Michigan , meat-processing plant. In the wrongful-death lawsuit filed against Sara Lee and Bil Mar Foods, a Memphis man alleges that his wife died of meningitis because she ate a Ball Park hot dog contaminated with Listeria monocytogenes bacteria. Laboratory tests from the federal Centers for Disease Control and Prevention and the Tennessee Health Department confirmed it was the same strain of Listeria that has caused 15 deaths and sickened 75 people in 16 states. The bacteria was found in unopened packages of Sara Lee meat products, said attorney Kenneth B. Moll. The suit was files in Cook County Circuit Court on behalf of John Bodnar, 76, a retired service manager at a Cadillac dealership in St. Louis, whose wife, Helen, died Oct. 19 after battling the bacterial infection for several weeks. Helen, a homemaker married to Bodnar for 53 years, died about one month before her 75th birthday. What could be extremely beneficial to the case is John Bodnar's daily journal, in which he jotted down the most minute details of his life, such as what he and Helen watched on TV or what they ate, for 26 years. On Aug. 13, he wrote that he and Helen, whom he called "Mom," ate a dinner of soup and hot dogs. Nine days later, they had hot dogs again. In the diary, Bodnar wrote that Helen first got sick on Oct. 3. Her condition worsened in the hospital and it wasn't until Oct. 9 that doctors began to suspect meningitis. A spinal tap the next day confirmed this. Ten days later, she died at St. Francis Hospital. Moll, who filed a separate lawsuit in December is seeking class-action status on behalf odf anyone who has gotten sick from Sara Lee meat products, said that he will be seeking "anywhere from $10 million to $50 million" in punitive damages and between $500,000 and $1 million in compensatory damages for Bodnar. He said the amount of punitive damages could be even greater if the jury finds Sara Lee was grossly negligent, as alleged in both suits. Bodnar was prepared to join the class-action suit, Moll said. But it could take years for a class action suit to go to trial, while this wrongful-injury case could be heard within six months, Moll said. Chicago-based Sara Lee announced in December a recall of more than 300 varieties of its hot dogs and deli meats, including such well-known brands as Ball Park franks and Mr. Turkey. Theresa Herlevsen, a Sara Lee spokeswoman, said the company doesn't comment on matters of pending litigation. 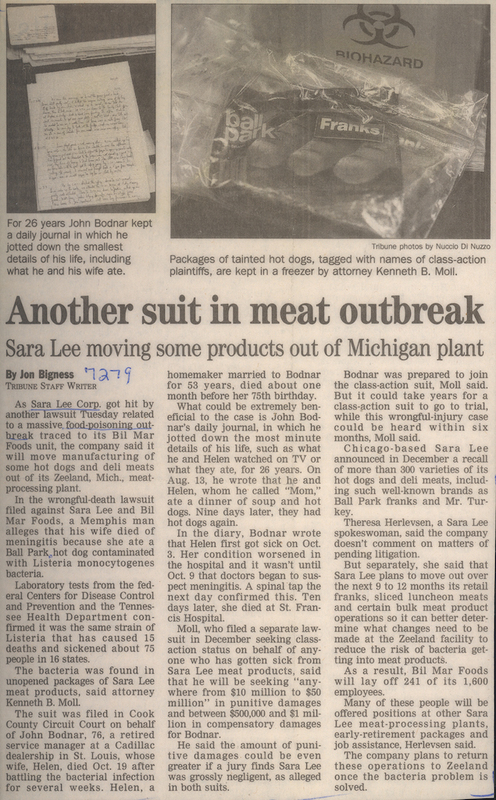 But separately, she said that Sara Lee plans to move out over the next 9 to 12 months its retail franks, sliced luncheon meats and certain bulk meat product operations so it can better determine what changes need to be made at the Zeeland facility to reduce the risk of bacteria getting into meat products. As a result, Bil Mar Foods will lay off 241 of its 1,600 employees. Many of these people will be offered positions at other Sara Lee meat-processing plants, early retirement packages and job assistance, Herlevsen said. The company plans to return these operations to Zeeland once the bacteria problem is solved.